Vankaya Pachchi Pulusu is one of the traditional veg recipes of Andhra Pradesh. The Telugu word 'vankaya' means egg plant i.e brinjal, the word 'pachchi' means 'raw' i.e uncooked and the word 'pulusu' is used for gravies that are used as side dish. Though most of you are familiar with this egg plant gravy, here I'm mentioning a variation in vankaya pachchi pulusu. Almost all the family members in my in-laws are too fond of this variety of egg plant gravy. They relish this gravy as a side dish for 'pindi' - a traditional veg tiffin made of rice ravva i.e coarsely ground rice. 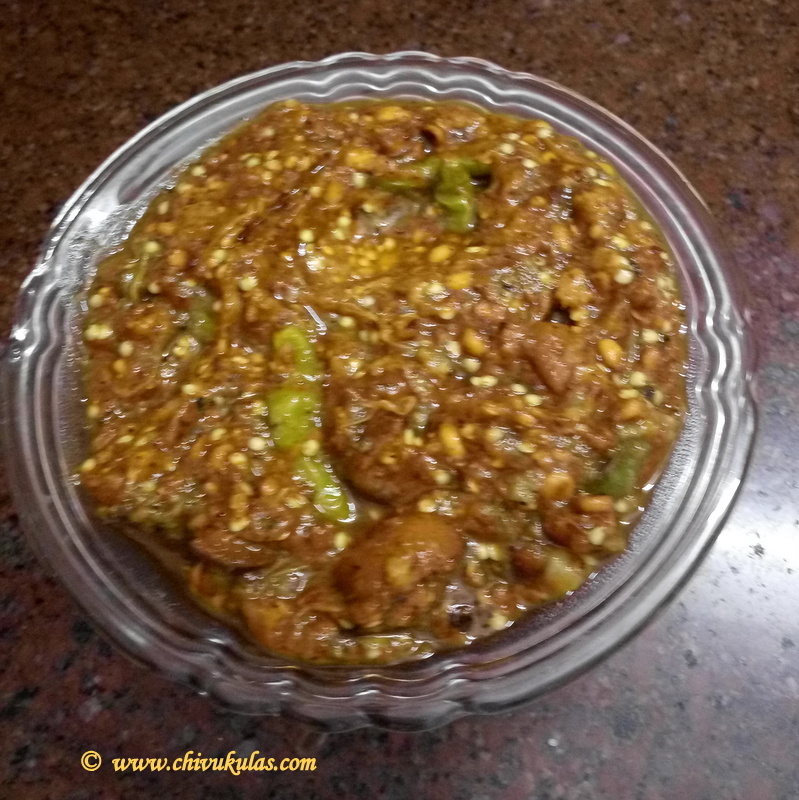 Vankaya pachchi pulusu is a tasty recipe which is easy to prepare. The combination of tamarind extract and jaggery gives a tangy sweet and sour taste. Let's look at the ingredients required for this traditional Andhra recipe. 1 pachchadi vankaya i.e large egg plant specially used for preparing pachchadi. 1 small lemon sized tamarind. Equal measure (as tamarind) jaggery. mustard seeds, split skinless black gram (badda minapappu), little fenugreek (methi) and dry red chillies for tempering (tadka). Apply little oil on the egg plant and roast it in a traditional way for typical taste. Soak tamarind in warm water for a while. Extract juice and keep it in a bowl. Add jaggery and salt to the tamarind extract. Heat a frying pan and fry chana dal without oil, till these turn brown. Add these to the tamarind extract. In the same pan heat enough oil and deep fry minapa vadiyalu. Add these to the tamarind extract. In the same oil, fry green chillies till the green color disappears. Add these to the tamarind extract. In the same pan, fry the tempering with little oil till done. Grind the tadka coarsely and mix it in the tamarind extract. Blend all the ingredients well. Egg plant gravy is done. You can relish / serve it with traditional 'pindi' or as a side dish with any other main dish like rotis etc. Add water till you get the required consistency. Some like it thicker while others like it too gravy. So, add water as per your liking.